The indigenously developed LCA (Light Combat Aircraft) Tejas has successfully fired Derby an air-to-air BVR (Beyond Visual Range) missile off the Goa coast. It demonstrated its overall capability as an effective combat jet, and inched closer to receive final operational clearance. Tejas was earlier given clearance for deployment of armaments and other missiles. Tejas has now successfully completed a series of captive flight trials to clear the Derby for full operational capability in the entire final operational clearance (FOC) envelope. 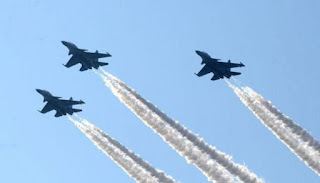 The aircraft was tracked by two other Tejas aircraft in close formation to capture the firing event in the specially instrumented high-speed cameras for detailed analysis. The entire planning, practice and final firing was carried out by DRDO's autonomous society – Aeronautical Development Agency (ADA) and its National Flight Test Centre (NFTC). Tejas has qualified for the armaments and missile release related trials. IAF tested its war-waging capabilities in a possible two-front scenario involving Pakistan and China during Gagan Shakti 2018. During the Gagan Shakti 2018 exercise, eight Tejas jets were deployed. The IAF has already committed to buying at least 123 Tejas fighters for Rs 75,000 crore from the Hindustan Aeronautics Limited (HAL). It is a short to medium range BVR Air-to-Air missile. It is developed jointly by Israeli armament development agency Rafael and Israel Aircraft Industries MBT has a maximum effective range of about 50 km. It is an active radar air-to-air missile for the fighter aircraft and has the capability to be launched at a target day or night and in all weather conditions. It has look-down/shoot-down capability, fire and forget mode and an advanced ECCM tailored to the customer's operational requirements. It is a dual-use missile (air-to-air and surface-to-air). The missile's light weight allows it to be adapted to various modern fighter aircraft.